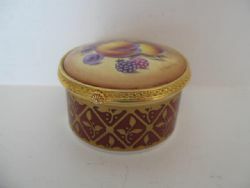 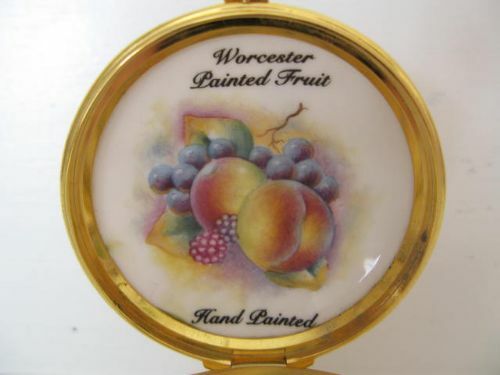 A Royal Worcester Fruit Painted Trinket Box By J Bowman. 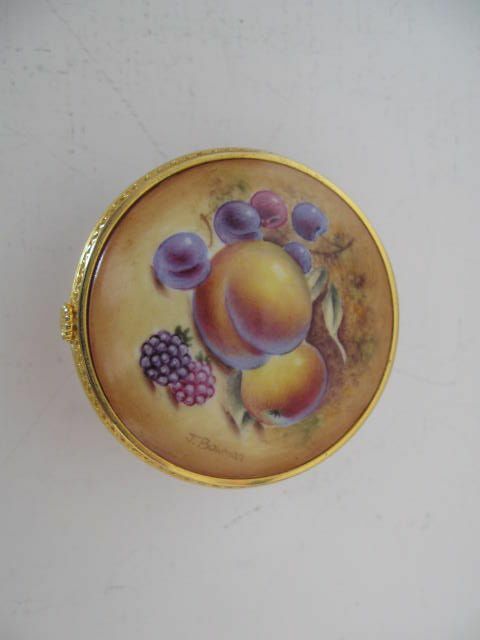 An attractive Royal Worcester porcelain and gilt metal mounted trinket box, with painted fruit decoration by J. 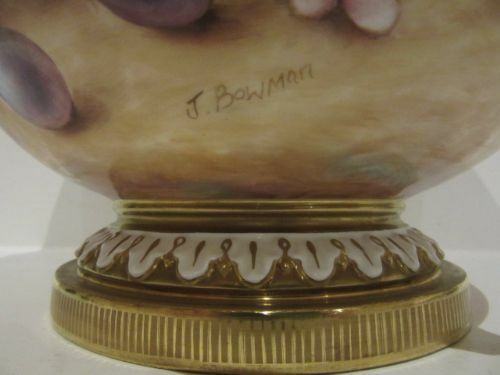 Bowman. 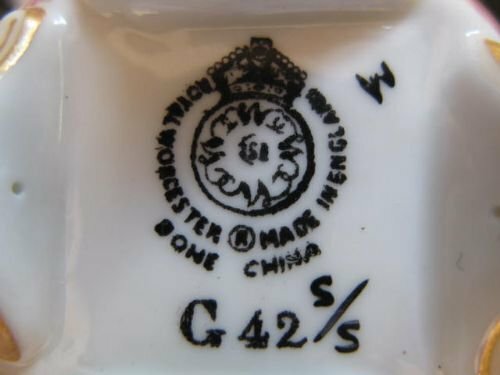 Measuring approximately 2.1/2"diameter x 1.1/2"tall, it has the black factory stamp for circa 1990 and is in excellent condition with no damage, crazing or restoration, and the gilding is bright and without wear. 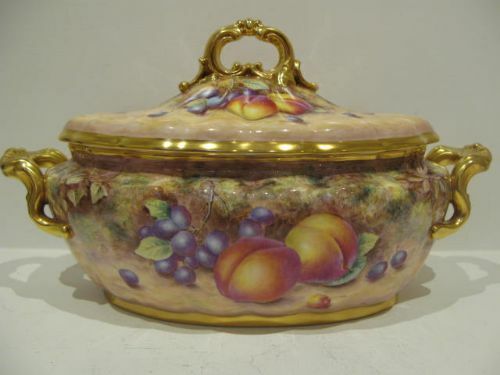 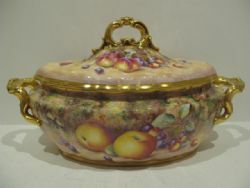 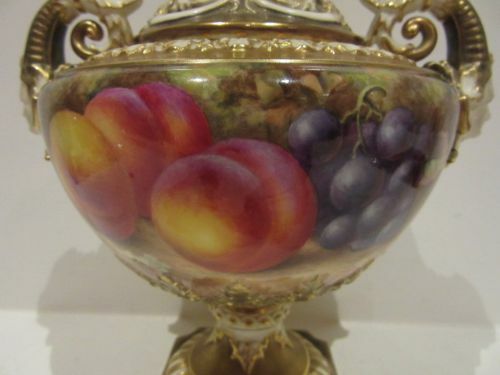 A Royal Worcester Fruit Painted Tureen By Freeman. 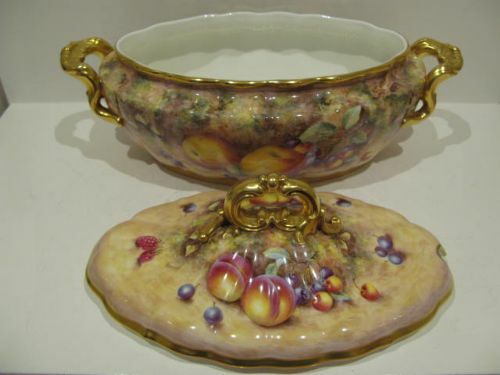 A fine quality and quite rare, Royal Worcester porcelain soup tureen and cover with well painted all around fruit decoration by John Freeman. 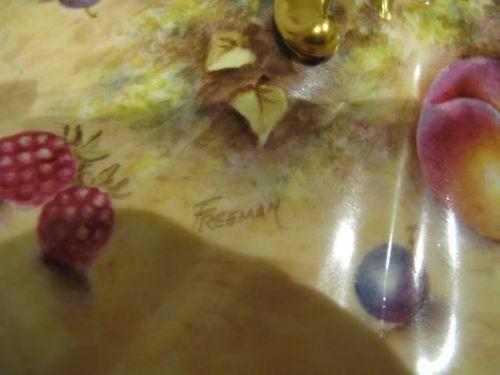 Standing an imposing 14.3/4"long over the handles x 8"wide x 8.1/2"overall height, it has the black factory stamp for circa 1970, is signed by Freeman to both the body and cover and is in excellent condition having spent all of its life in a display cabinet with no damage, crazing or restoration and the gilding is as good as the day it was made. 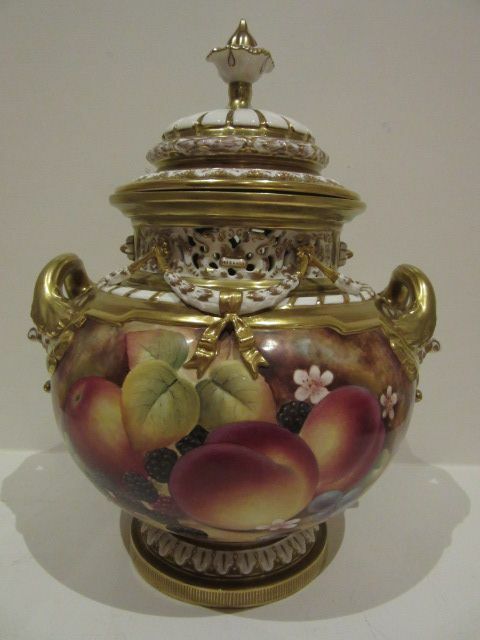 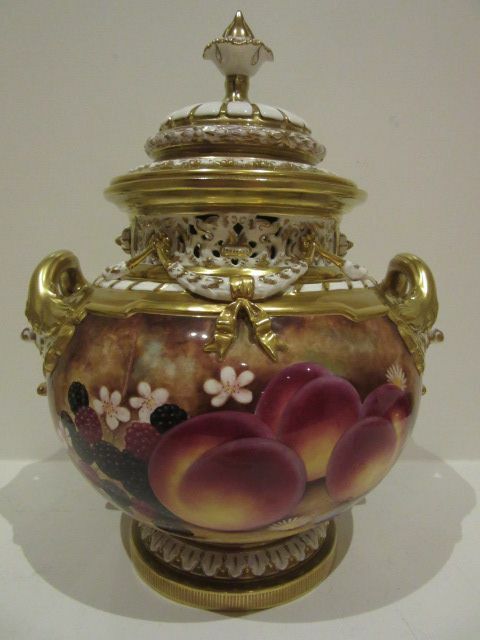 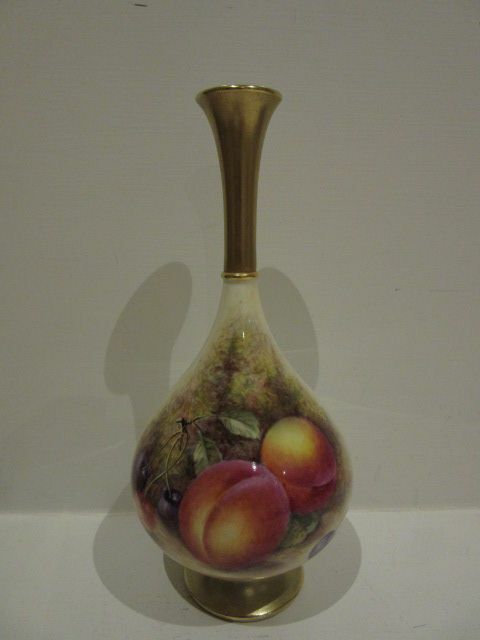 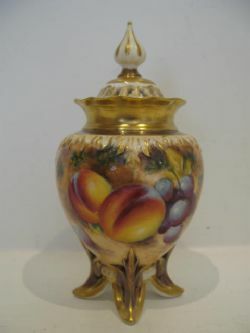 A Royal Worcester Fruit Painted Vase And Cover By Cox. 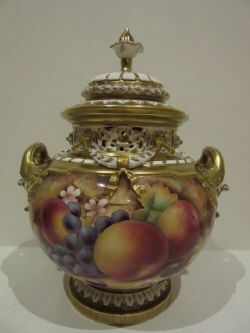 A Royal Worcester porcelain vase and cover, shape number 2363, with well painted all-around fruit decoration by Brian Cox. Standing approximately 8.1/4" overall height x 4.3/4"wide over the handles, it has the black factory stamp for circa 1985 and is in excellent condition with no damage, crazing or restoration, and the gilding is bright and without wear. A large and impressive Royal Worcester porcelain vase and cover, shape number 1691, with well painted all-around fruit decoration by Brian Cox. Standing approximately 14"tall x 8.1/2"wide over the handles, it has the black factory stamp for circa 1985 and is in excellent condition with no damage, crazing or restoration, and the gilding is bright and without wear. 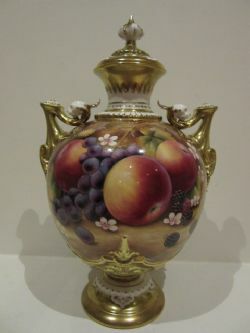 A Royal Worcester Fruit Painted Vase And Cover By H. Ayrton. 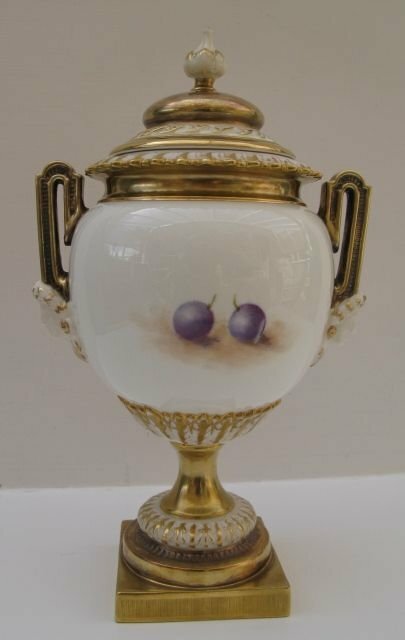 An impressive, Royal Worcester porcelain vase and cover, shape number 1572, with ornate mask handles and decorated with well painted plums and purple grapes against a mossy background by Harry Ayrton. 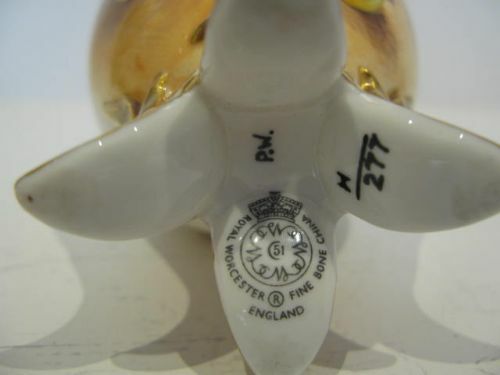 Measuring approximately 10.3/4"tall to the tip of the finial x 7.1/4"wide over the handles, it has the black factory stamp for 1959 and is in excellent condition with no damage, crazing or restoration and the gilding is bright and with only one slight area of wear to the base. A Royal Worcester Fruit Painted Vase And Cover By J. 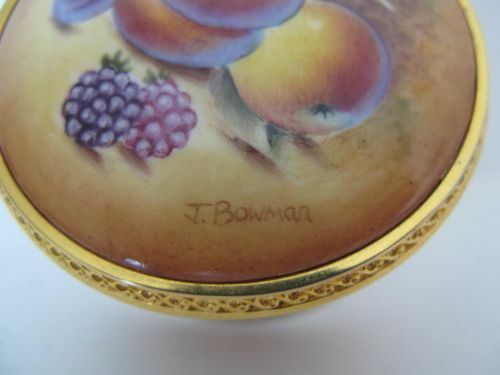 Bowman. 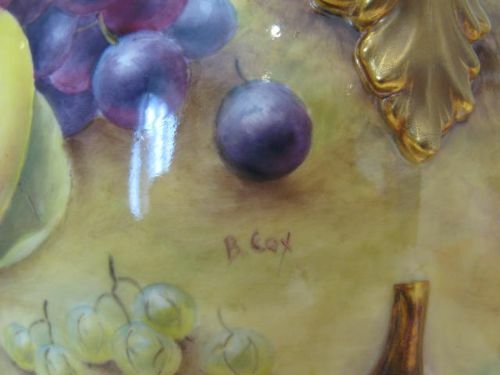 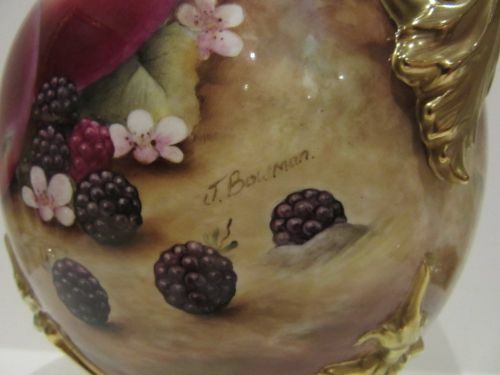 A Royal Worcester porcelain "Bow" vase and cover, shape number 1428 s/s, with all around painted apples/purple grapes/brambles and plums against a mossy background by Jason Bowman. 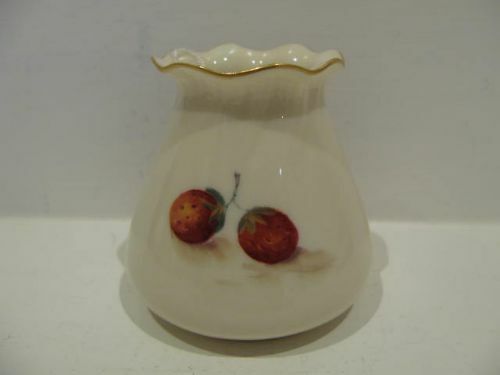 Standing approximately 12.3/4" overall height x 10"wide over the handles, it has the black factory stamp for post 1985 and is in excellent condition with no damage, crazing or restoration and the gilding is bright and virtually without wear. A Royal Worcester porcelain vase and cover, shape number 1428 s/s, with all around painted brambles/plums/apples and purple grapes against a mossy background by Jason Bowman. 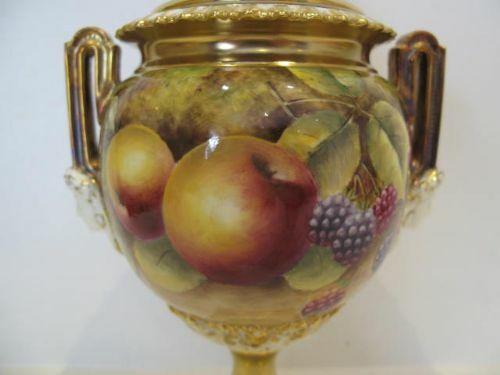 Measuring approximately 12.3/4"overall height x 10"wide over the handles, it has the black factory stamp for post 1985 and is in excellent condition with no damage, crazing or restoration and the gilding is bright and virtually without wear. 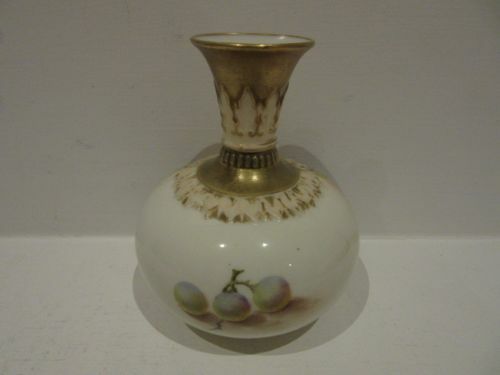 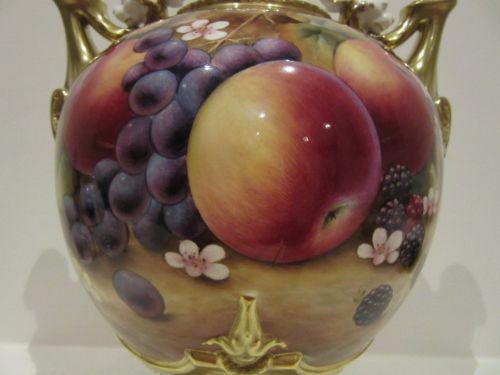 A Royal Worcester porcelain "Trophy" vase and cover, shape number 1691, with all around painted apples/plums/ purple grapes and brambles against a mossy background by Jason Bowman. 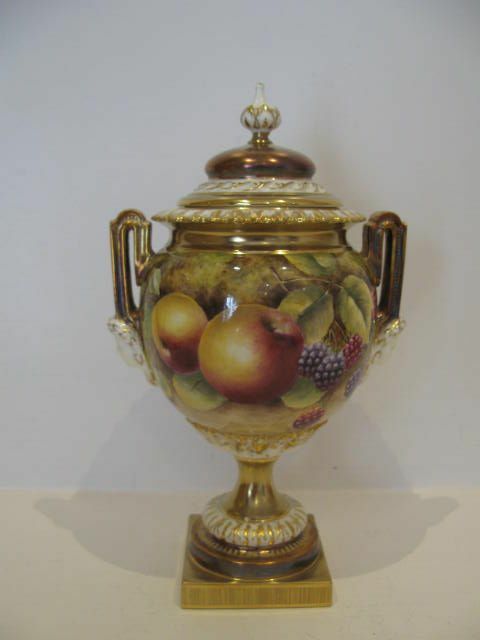 Measuring approximately 14.1/4"overall height x 9"wide over the handles, it has the black factory stamp for post 1985 and is in excellent condition with no damage, crazing or restoration and the gilding is bright and virtually without wear. 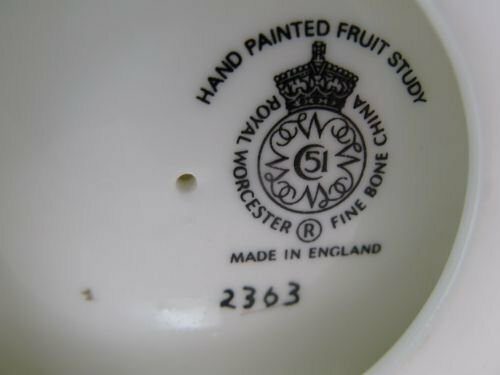 Apologies for the white spots showing on some of the fruit. 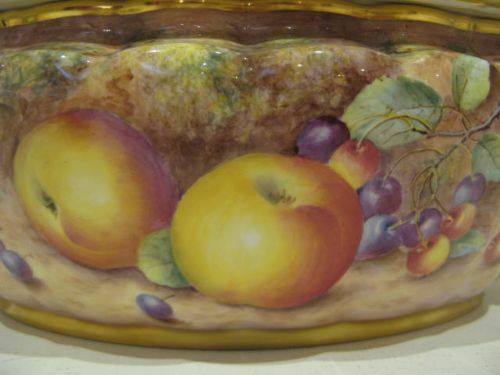 These are only reflections from the lighting and do not exist. 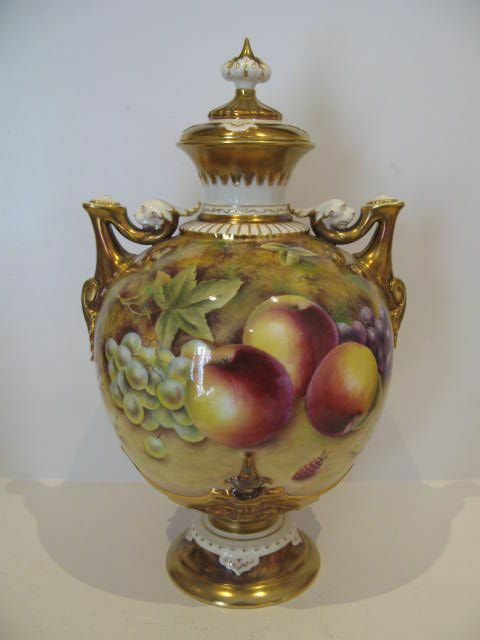 A Royal Worcester Fruit Painted Vase And Cover By J.Cook. 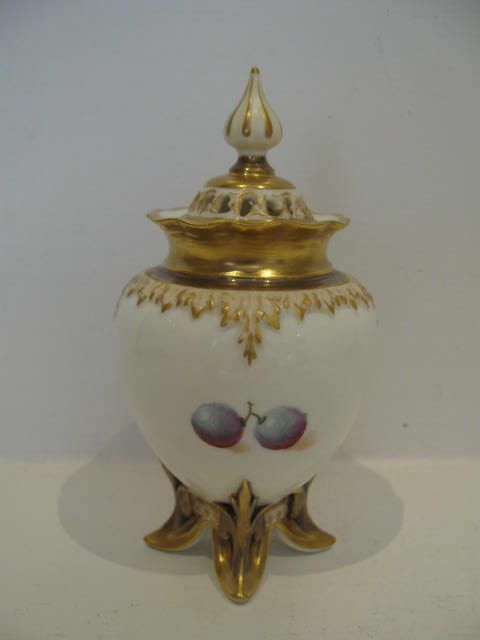 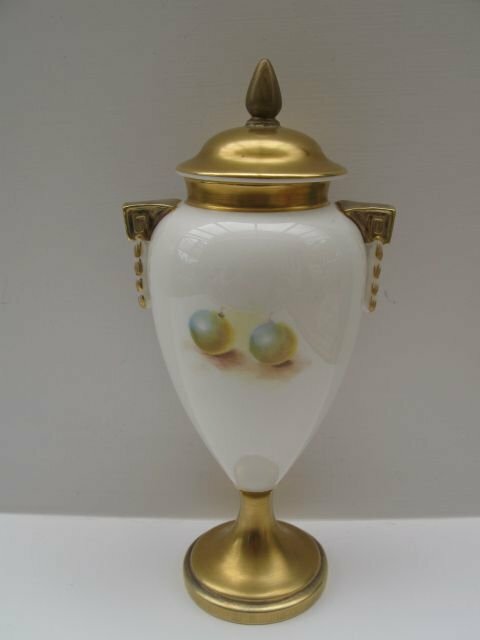 A Royal Worcester porcelain vase and cover, shape number 2713 with well painted fruit decoration, by John Cook. 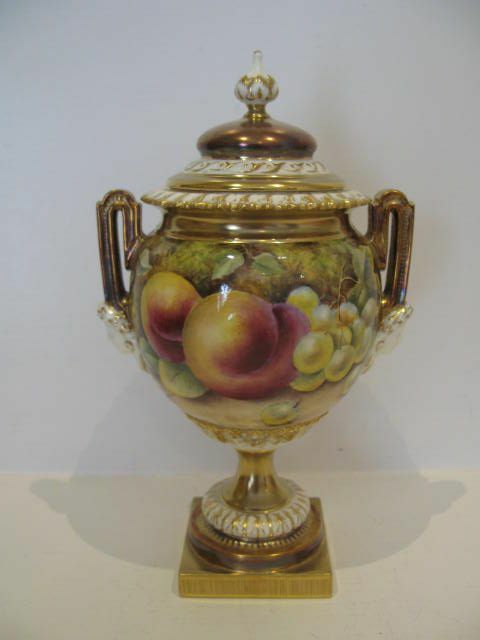 Standing approximately 8.1/4"overall height x 3.3/4"wide over the handles, it has the black factory stamp for the last quarter of the 20th century and is in excellent condition, with no damage, crazing or restoration, and the gilding is fresh and unworn. 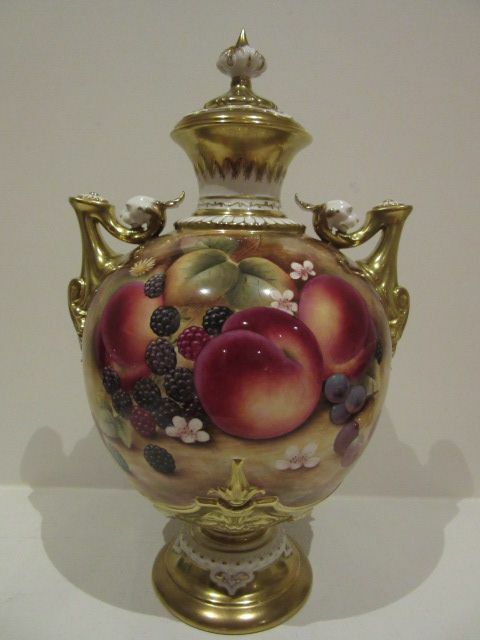 A Royal Worcester Fruit Painted Vase And Cover By P.Stanley. 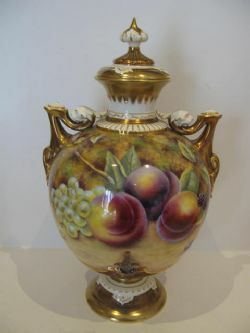 An attractive Royal Worcester porcelain vase and cover, shape number 2363, with painted fruit decoration by Paul Stanley. 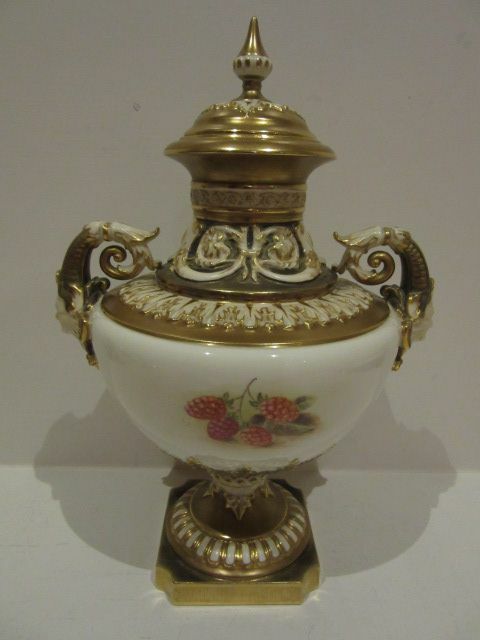 Standing approximately 8.1/4"overall height x 5"width over the handles, it has the black factory stamp for the last quarter of the 20th century and is in excellent condition with no damage, crazing or restoration and the gilding is without wear. 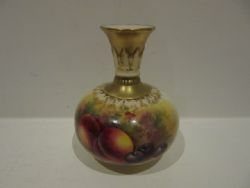 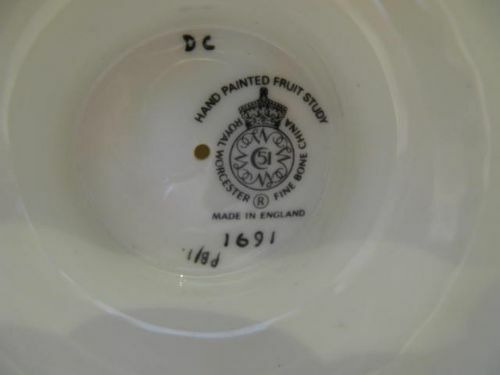 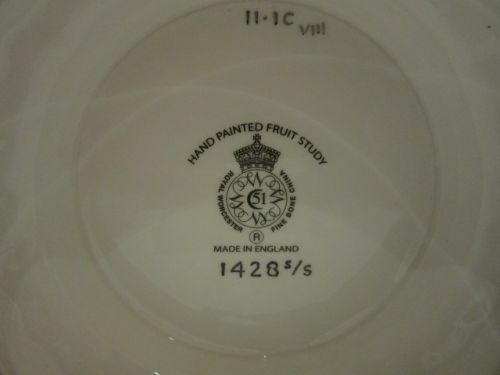 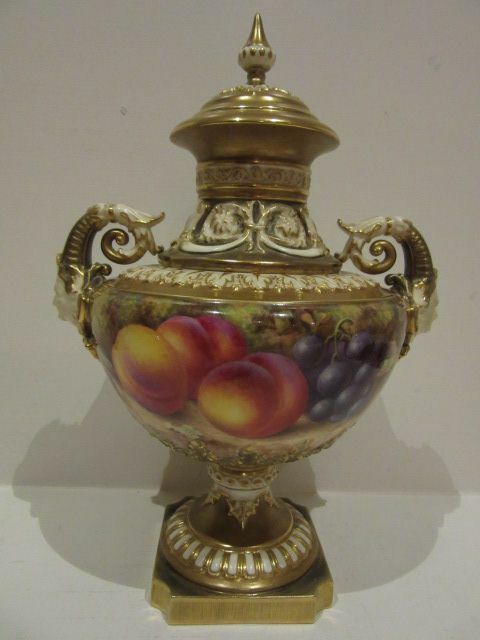 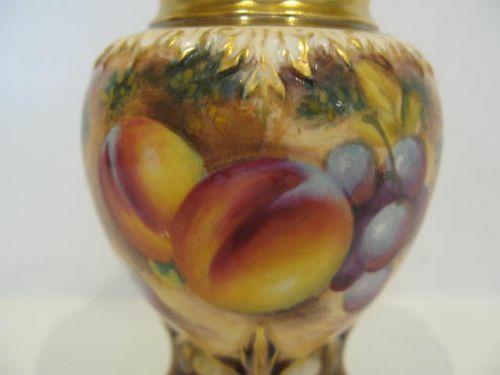 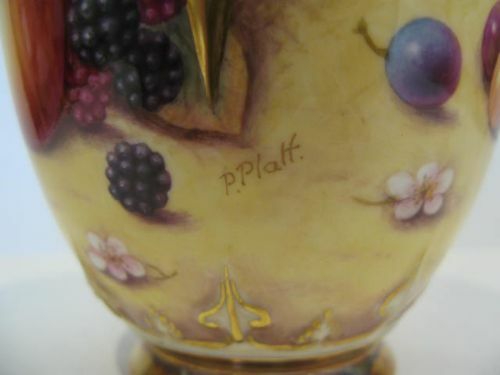 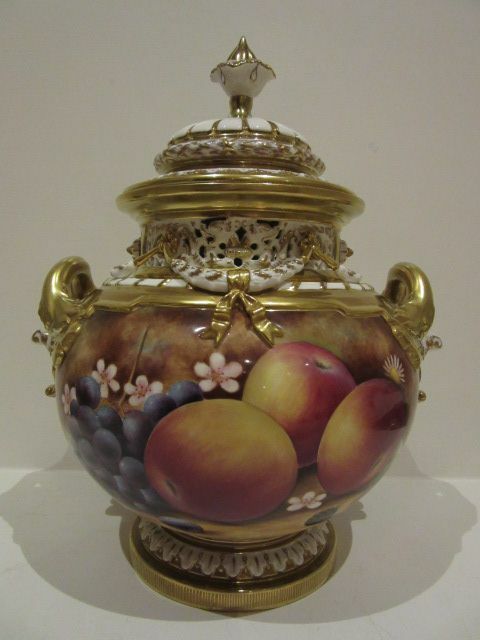 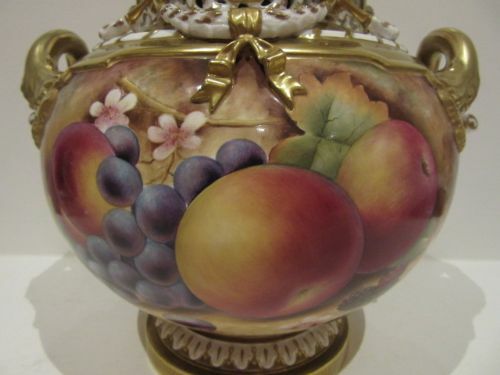 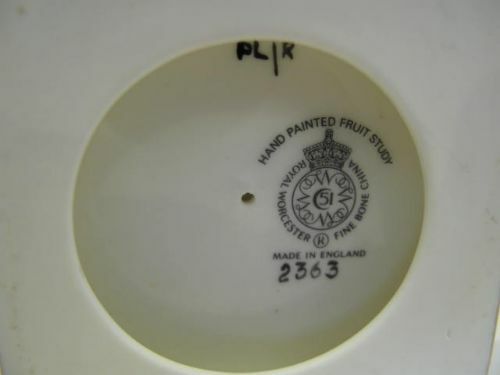 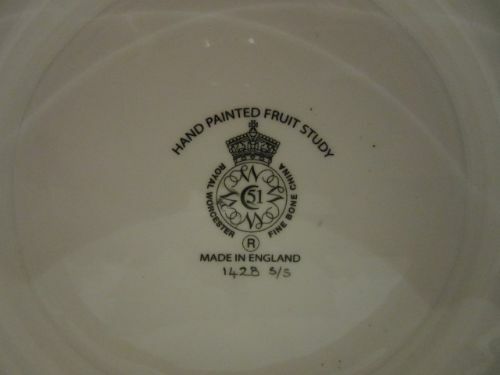 A Royal Worcester Fruit Painted Vase And Cover By Platt. 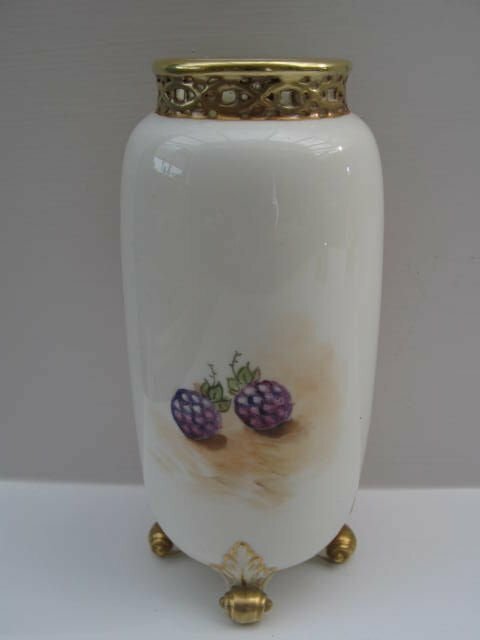 An attractive Royal Worcester porcelain vase and cover, shape number H169B, with well painted all-around fruit decoration by Peter Platt. 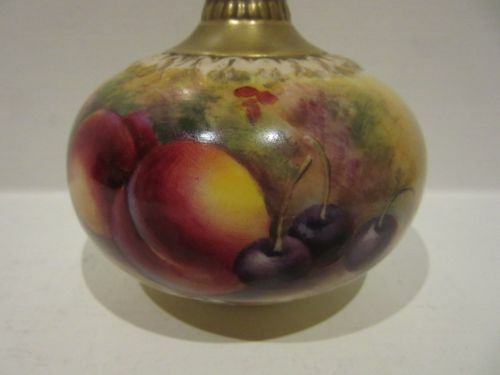 Standing approximately 7.1/2"overall height x 4.1/4"diameter, it has the black factory stamp for circa 1985 and is in excellent condition with no damage, crazing or restoration, and the gilding is bright and without wear. 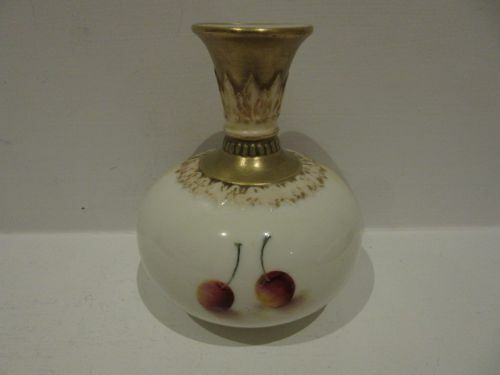 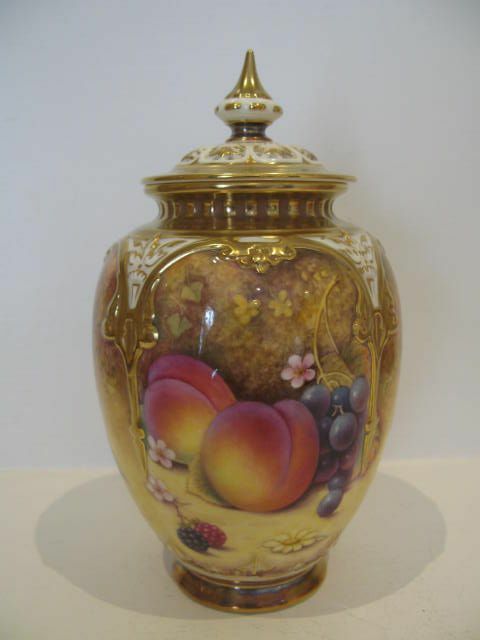 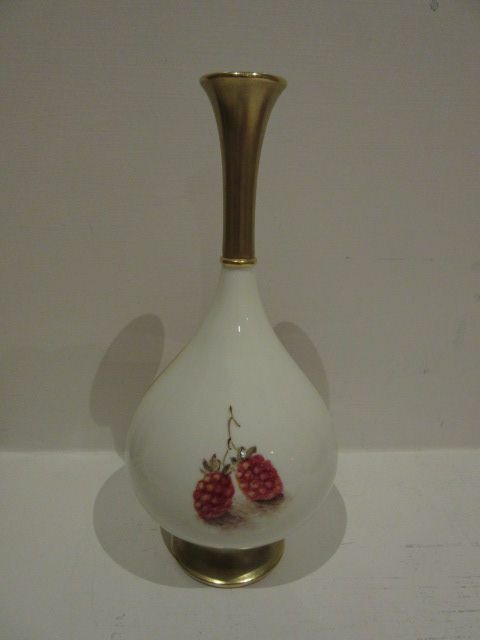 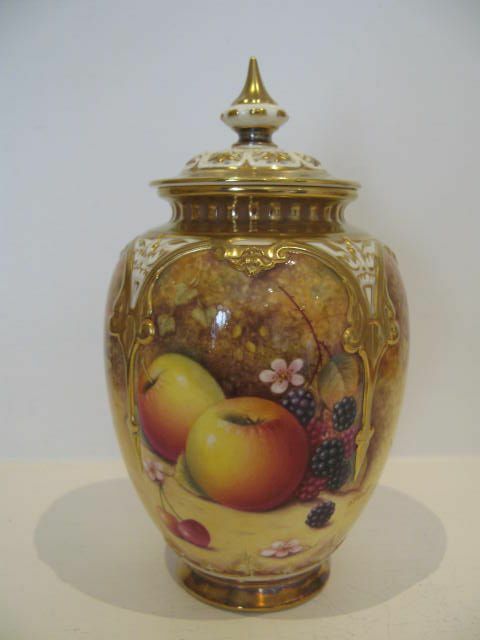 A Royal Worcester Fruit Painted Vase And Cover By Roberts. 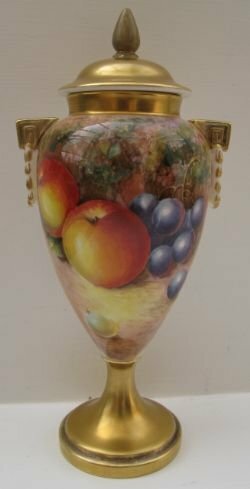 An attractive royal Worcester porcelain vase and cover, shape number H277, with well painted fruit decoration by William Roberts. 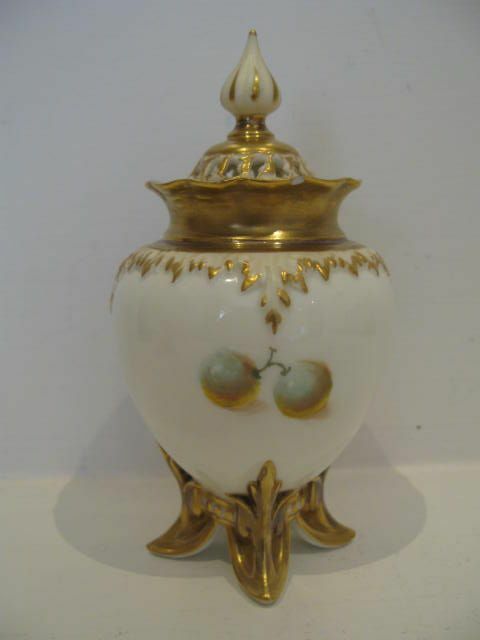 Standing approximately 5.1/4"overall height x 2.3/4"diameter, it has the black factory stamp for circa 1970 and is in nice condition with no crazing or restoration and the gilding is bright and without rubbing. 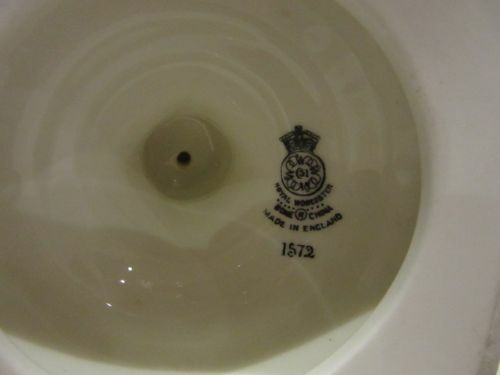 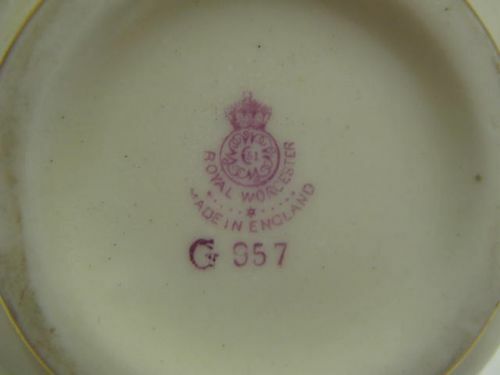 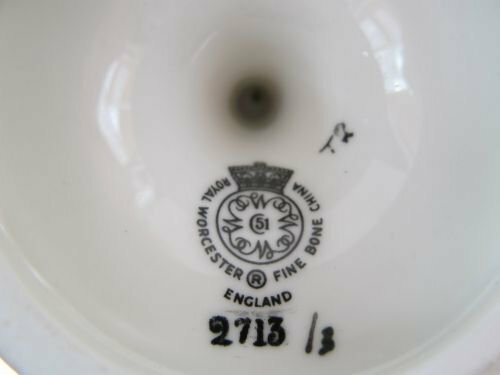 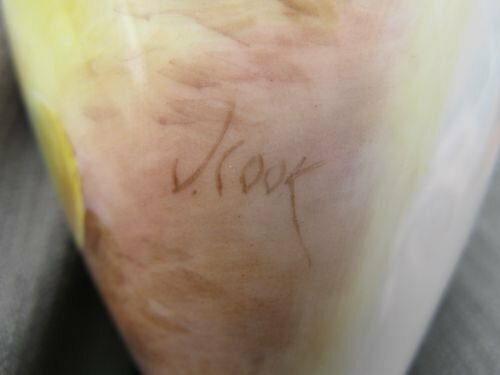 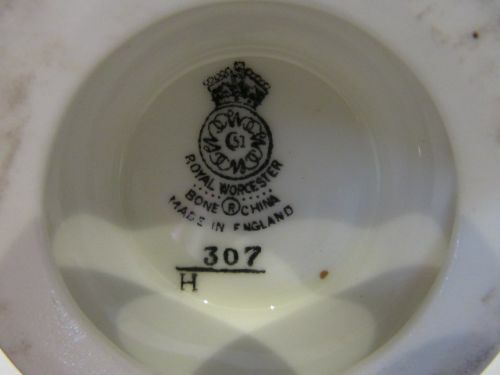 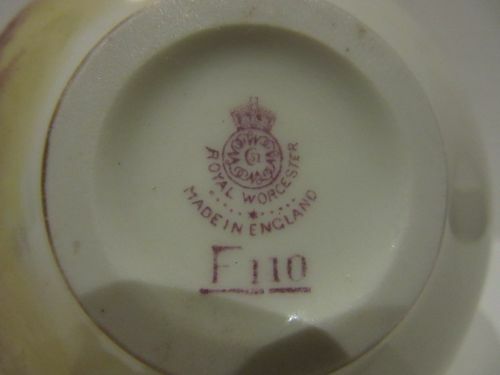 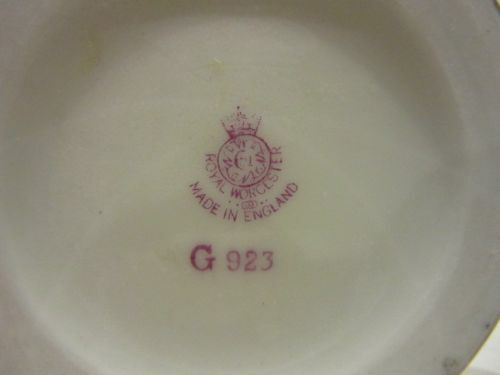 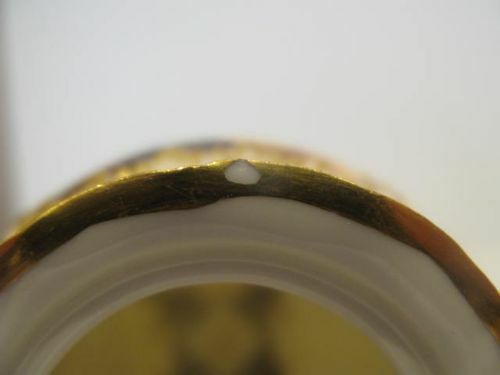 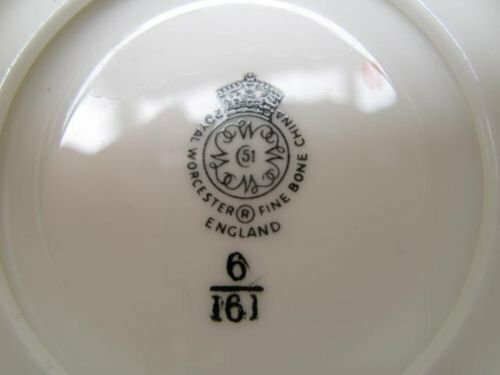 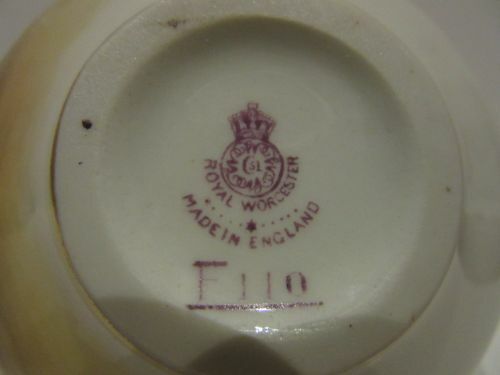 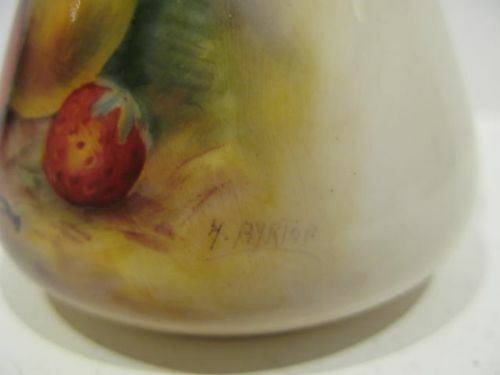 There are however two small chips, one to the top edge of the vase rim which can be seen in picture 4, the other underneath the rim as shown in picture 3 and the vase is priced to reflect these. A Royal Worcester porcelain vase and cover, shape number H277, with well painted fruit decoration by William Roberts. 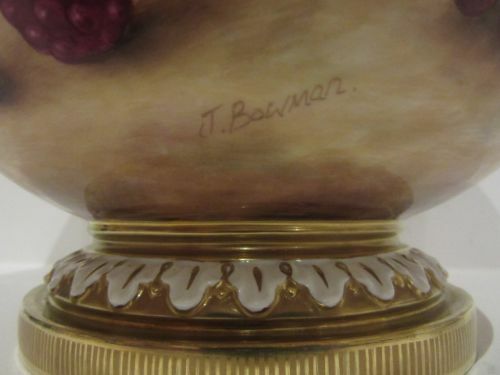 Standing approximately 5.1/4"overall height x 2.3/4"diameter, it has the black factory stamp for circa 1970 and is in excellent condition with no damage, crazing or restoration, and the gilding is bright and without wear. 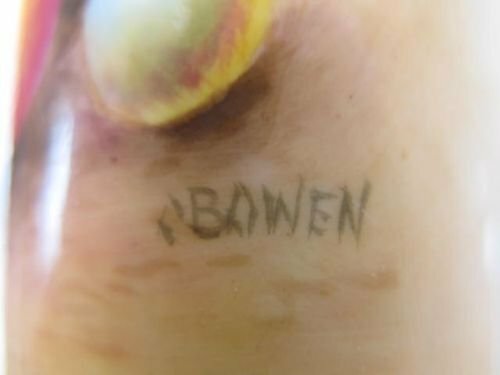 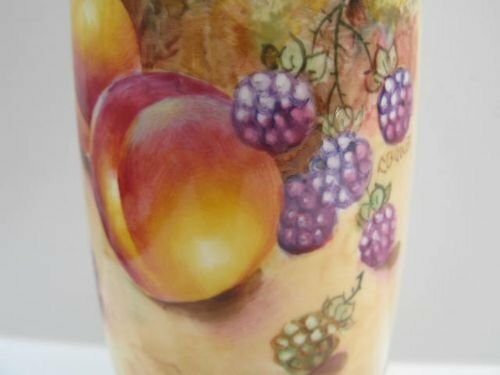 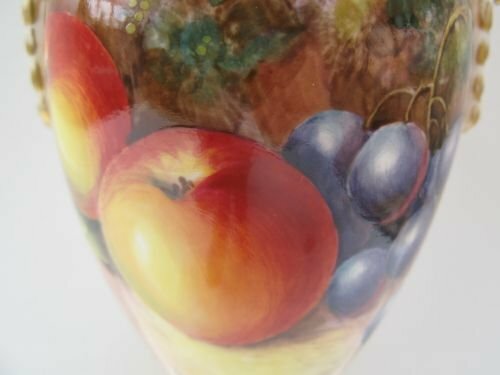 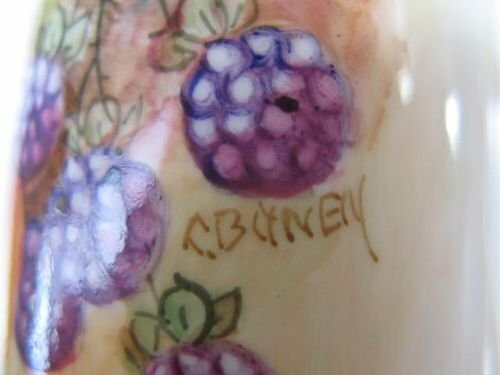 A Royal Worcester Fruit Painted Vase By C. Bowen. 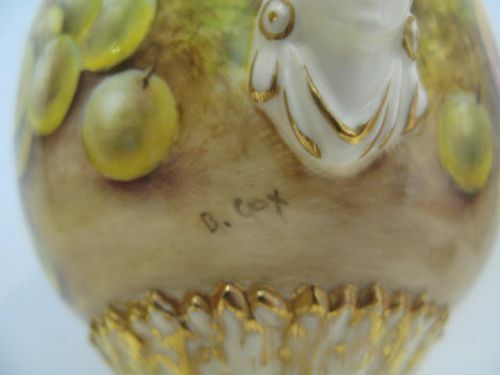 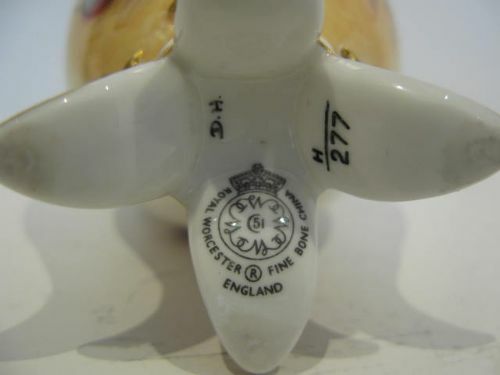 A Royal Worcester porcelain vase, shape number G42, raised on four feet, the neck pierced and the body with fruit painted decoration by Christopher Bowen. 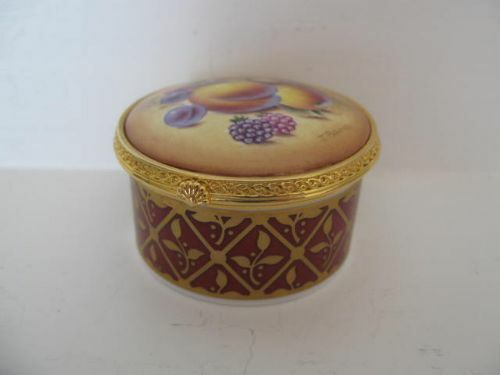 Standing approximately 5.3/4" tall x 2.1/2" diameter, it has the black factory stamp for circa 1975 and is in excellent condition with no damage, crazing or restoration, and the gilding is fresh and unworn. 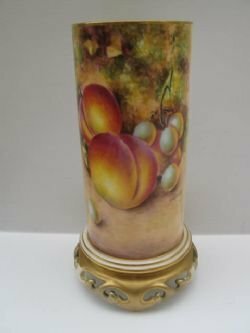 A Royal Worcester porcelain cylindrical vase on pierced foot, shape number 161, with fruit painted decoration by Christopher Bowen. 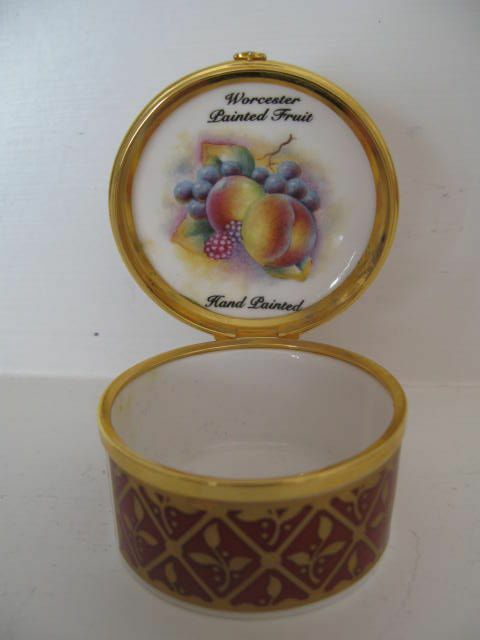 Standing approximately 6.3/8" tall x 2.1/2" diameter, it has the black factory stamp for circa 1970 and is in excellent condition, with no damage, crazing or restoration, and the gilding is fresh and unworn. 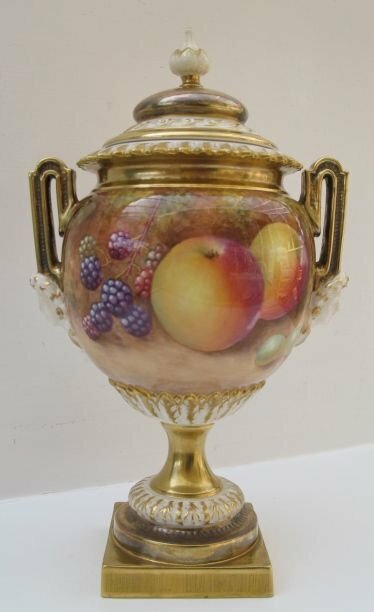 A Royal Worcester Fruit Painted Vase By E. Townsend, 1926. A small and attractive Royal Worcester porcelain vase, shape number F110, decorated with well painted ripe fruit against a mossy background by Edward Townsend. 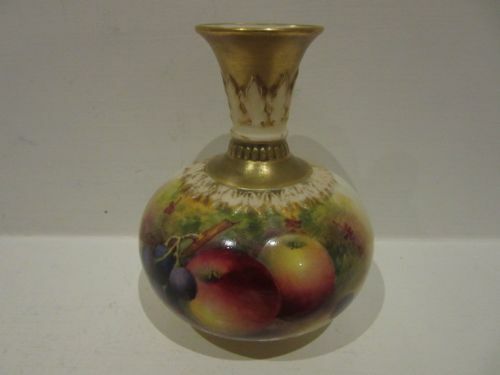 Measuring approximately 4"tall x 3/1/4"diameter, it has the puce factory stamp for 1926 and is in good condition with no damage, crazing or restoration and the gilding is bright but shows some wear on the shoulder where the neck joins the body. 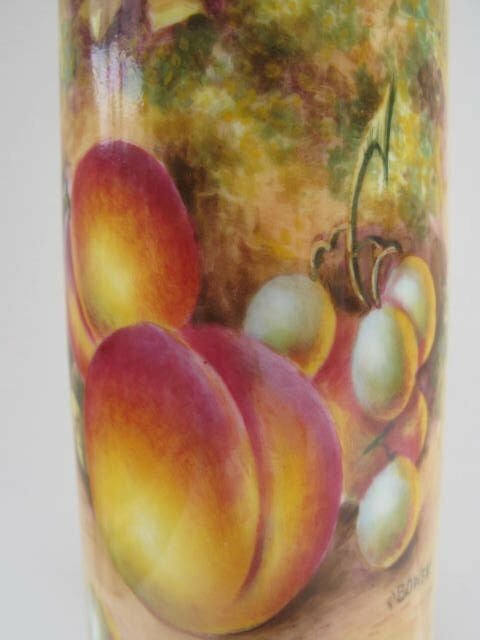 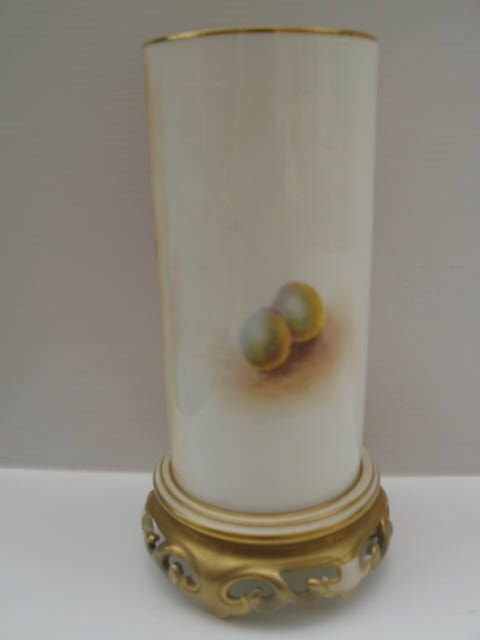 This is the pair to the previous item, being a small and attractive Royal Worcester porcelain vase, shape number F110, decorated with well painted ripe fruit against a mossy background by Edward Townsend. 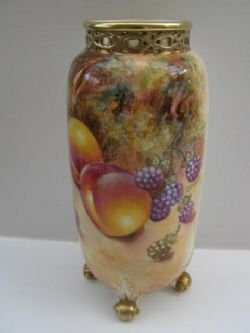 Measuring approximately 4"diameter x 3.1/4"tall, it has the puce factory stamp for 1926 and is in good condition with no damage, crazing or restoration, and the gilding is bright but shows some wear to the shoulder where the neck joins the body. 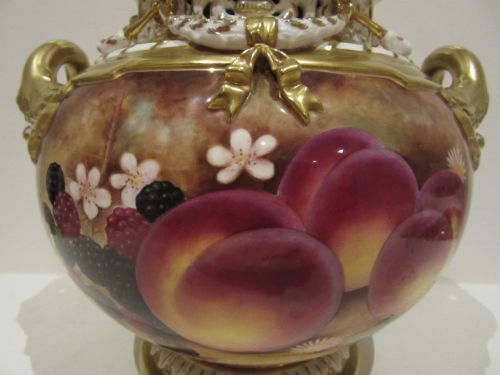 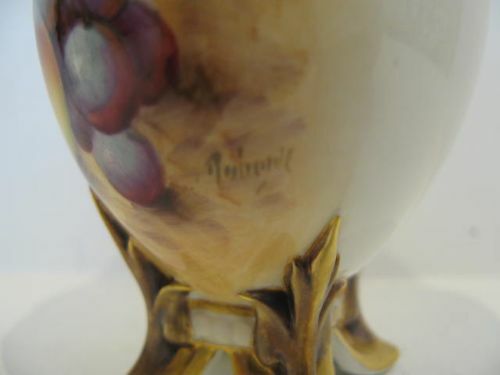 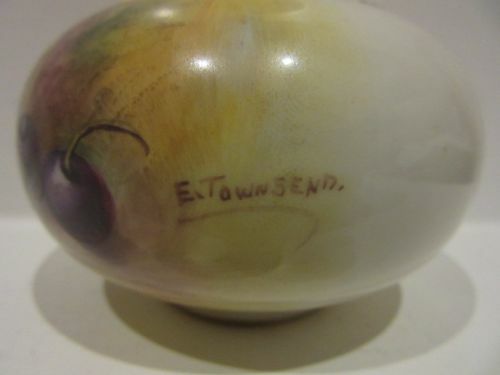 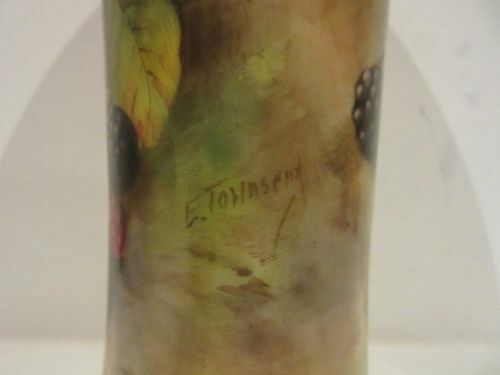 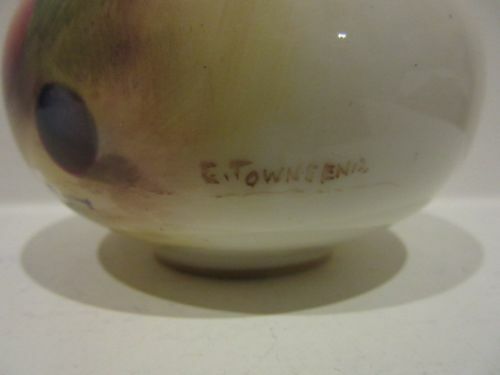 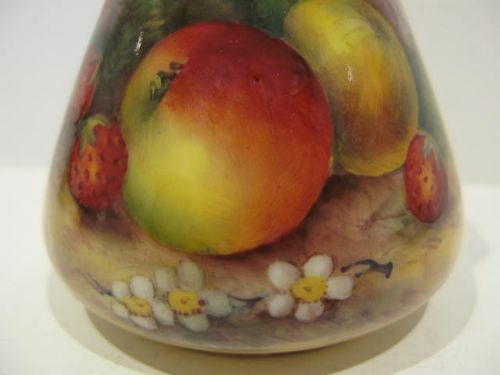 A Royal Worcester Fruit Painted Vase By E. Townsend. 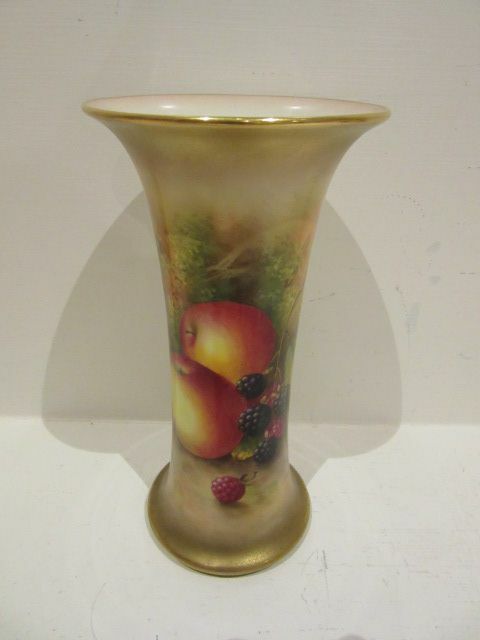 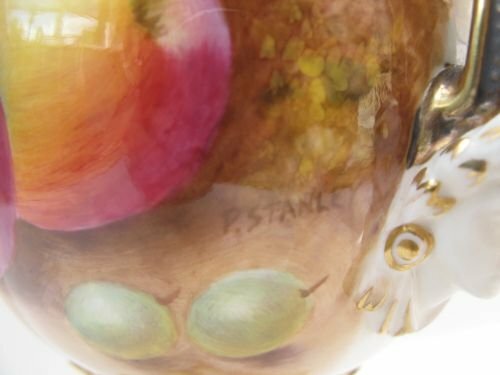 A Royal Worcester porcelain trumpet shaped vase, shape number G923, decorated with well painted apples and brambles against a mossy background by Edward Townsend. 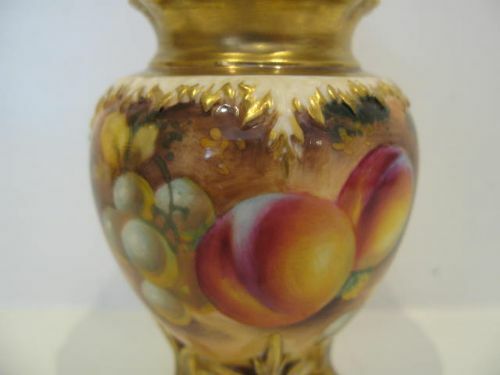 Standing approximately 7.1/2"tall x 3.3/4"maximum diameter, it has the puce factory stamp for 1936 and is in very good condition with no damage, crazing or restoration and the gilding is bright and shows virtually no signs of wear. 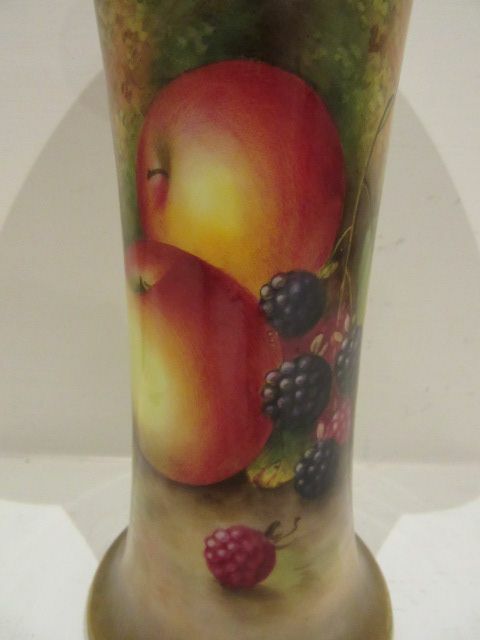 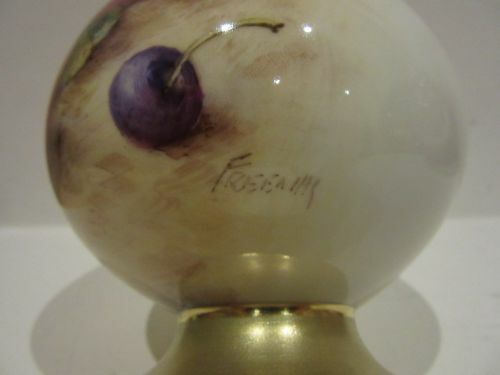 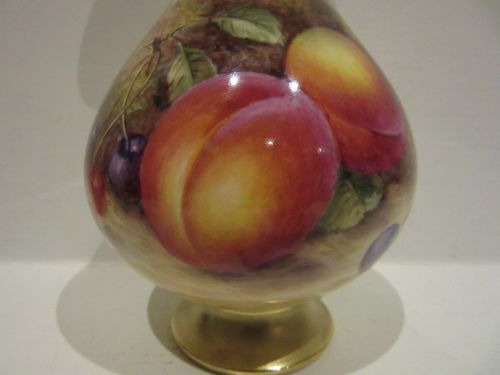 A Royal Worcester Fruit Painted Vase By Freeman, 1960. 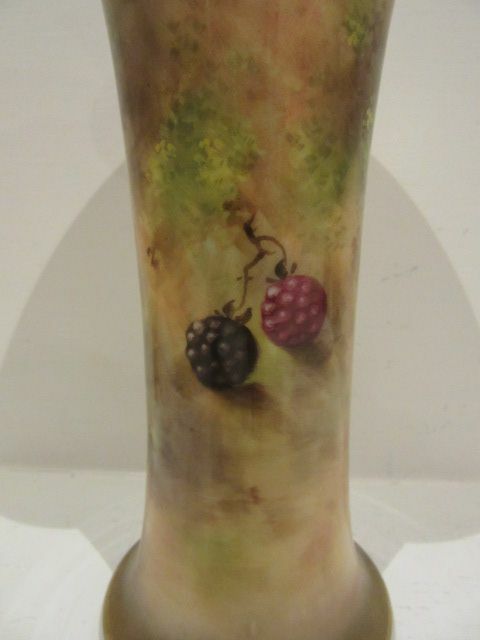 A Royal Worcester porcelain vase, shape number H307, decorated with painted plums and black and red cherries against a mossy background by John Freeman. 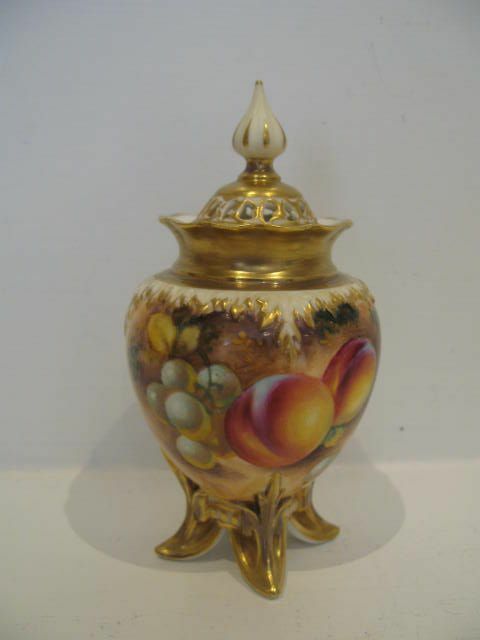 Standing approximately 7.3/4"tall x 3.3/4"diameter, it has the black factory stamp for 1960 and is in very good condition with no damage, crazing or restoration and the gilding is bright and has no losses. 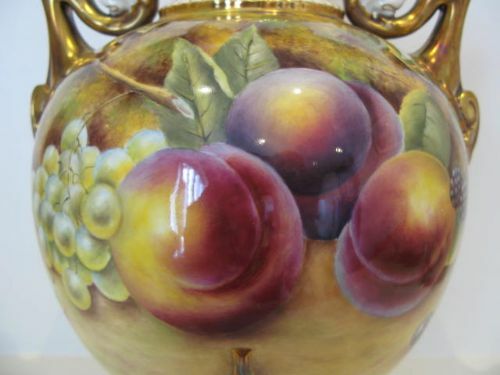 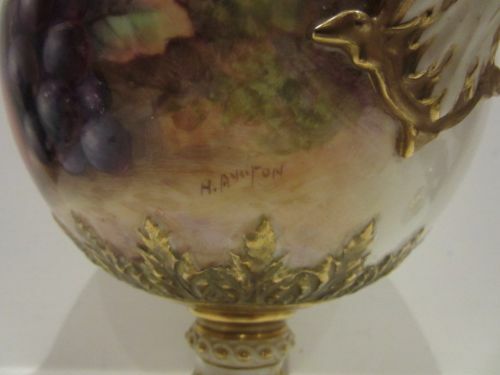 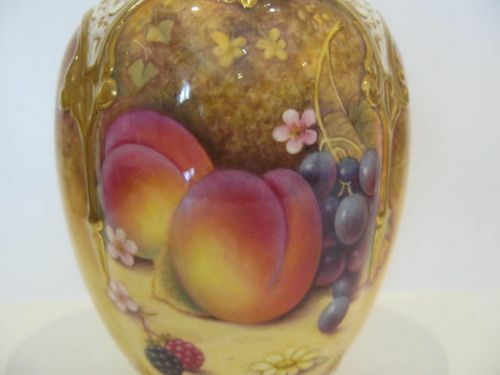 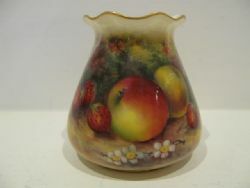 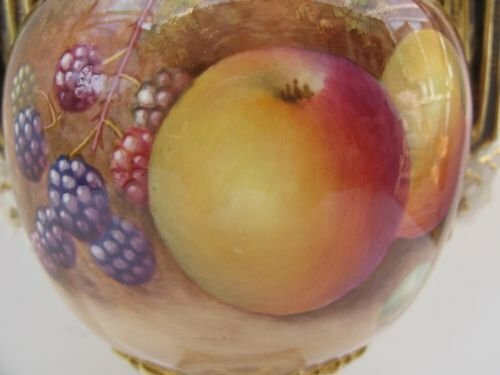 A Royal Worcester Fruit Painted Vase By H Ayrton. 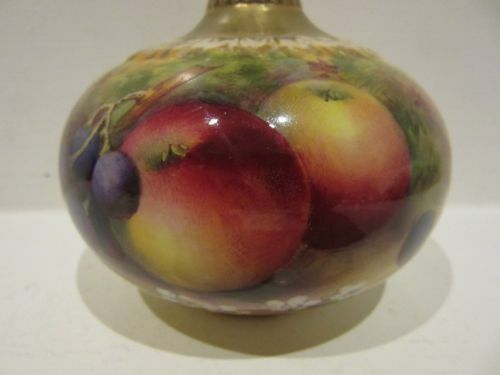 with well painted fruit decoration by Harry Ayrton. 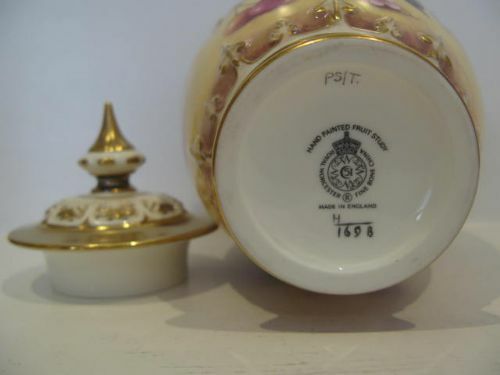 Standing approximately 3.1/8"tall x 3.1/4"diameter, it has the puce factory stamp for 1926 and is in very good condition with no damage, crazing or restoration and the gilding shows only the slightest signs of wear. 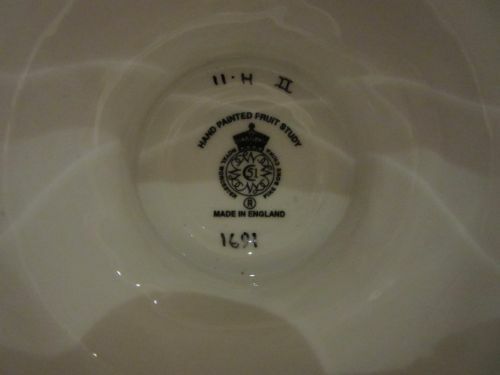 Please note:- Any white marks showing in pictures 1 and 2 are reflections only.